Synopsis: Your heart is racing. You shiver with fear. You've caught what's going around. You've got the fever, the frenzy and all the thrills. 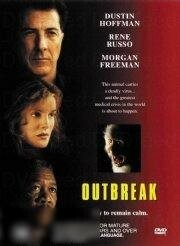 You're watching Outbreak. Big-name stars join director Wolfgang Petersen (In the Line of Fire) for big excitement in this breathless technothriller. Two-time Academy Award winner Dustin Hoffman plays Sam Daniels, a take-charge army virologist trying to stave off global biological meltdown. A rare killer virus from the jungles of Zaire has taken hold in a California community. It knows no boundaries. Its mortality is 100%. And some say the only way to stop its spread is to firebomb the town and everyone in it. Rene Russo, Morgan Freeman, Donald Sutherland and more superb talents join Hoffman in this shocking, nail-biting tale of the day that could become doomsday.